The challenge of creating climate change can not be addressed through “half-measures and empty commitments,” said Secretary of State John Kerry, as he urged world powers to commit to carbon reduction goals, ahead of a major United Nations conference. “We have spent years dancing around the same issues, firmly entrenched in individual excuses and arguments,” said Kerry. “All the while, the problem has just gotten worse,” he added. 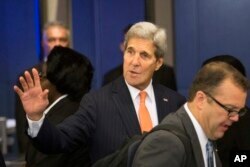 Kerry commented during a Tuesday ministerial forum, co-hosted by France, on the sidelines of the U.N. General Assembly. In November, France will preside over the Conference of Parties to the U.N. Framework Convention on Climate Change. Nearly 200 states have committed to the overall goal of the U.N. framework to reach a universally, legally binding agreement on climate change measures. U.S. Secretary of State John Kerry arrives for the 70th session of the United Nations General Assembly at U.N. headquarters, Sept. 28, 2015. Carbon dioxide is the main greenhouse gas emitted through human activities. Kerry said nations that together account for more than 70 percent of global emissions had declared their individual commitments to address the problem. “Do we want more? Obviously, we do,” he told foreign ministers. French Foreign Minister Laurent Fabius said he was “cautiously optimistic” about the Paris conference and the chances of getting an agreement. He said 109 countries had already presented their commitments. France has also pledged additional financial support to help developing countries address climate issues. During a Monday speech to the U.N. General Assembly, President Francois Hollande said his country would increase its contribution to this effort by about $2.2 billion. The U.N. Framework Convention on Climate Change was adopted during a Brazil summit on the environment in 1992.